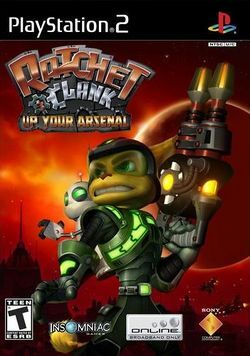 Ratchet & Clank: Up Your Arsenal is the third entry in the Ratchet & Clank series for PlayStation 2. It was released on November 2, 2004 to critical acclaim by Insomniac Games. Many people consider this game the highest point in the entire series. This game is the first appearance of Dr. Nefarious, and multiplayer. This page was last edited on 10 September 2011, at 18:59.